Before we get started, let’s address the elephant in the room: Cohort analyses aren’t exactly a SaaS metric. But when it comes to the tools and visualizations at your disposal for growing your SaaS business, cohorts are an essential piece of the puzzle. A cohort analysis enables you to observe how a specific group of customers (a cohort) evolves over time. Understanding user behavior over the course of a customer’s lifetime helps you optimize everything from plans and pricing to product features. The reason for this grouping is that it gives us a good segmentation that can show us trends in behavior over time. That “Signed up June 2018” cohort will always remain, and you’ll track their journey as a user of your product. There are other ways to group cohorts for analysis (grouping by segment or size), but time-based cohorts are by far the most common approach in SaaS. A cohort analysis is a visual chart for plotting and comparing the progression of specific metrics for each cohort over time. For example, typically in SaaS we would look at the progression of retention rate, plotting retention values for each month following the cohort’s creation. Cohort analyses also allow us to directly compare cohorts to each other — by lining up the starting date of each cohort. Why are cohort analyses useful? In the second example, you can focus efforts on understanding what’s happening in month three, engaging with customers at that point in their lifetime and applying additional customer success resources. Note: Cohorts only really work well with monthly subscriptions (or shorter time intervals) and it’s very important not to mix annual subscriptions into your monthly cohorts. Each column represents a month following the cohort’s creation (month zero being the month of signup). 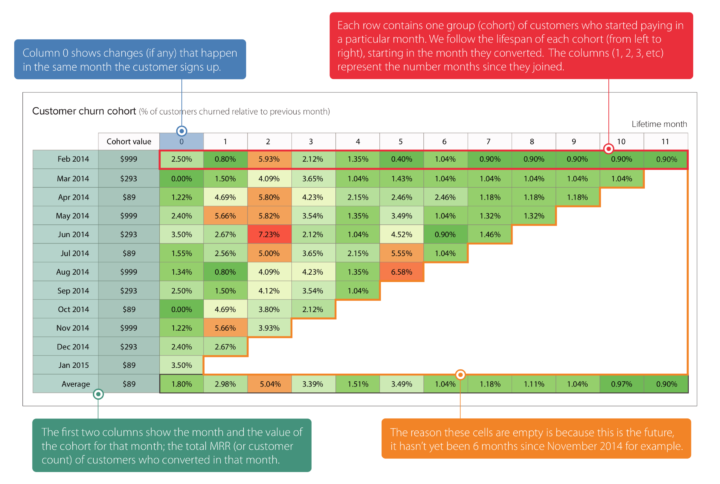 The value in each cell is typically the churn rate or retention rate relative to the previous month. Why are some of the cells blank? Because these cells reference a point in the future! This chart type is extremely useful for quickly identifying problematic months with respect to churn or retention. The color shading (green = low churn, red = high churn) draws our eyes to the problem areas immediately. In this example, month two was showing a spike in churn for earlier cohorts, but appears to have improved from the August 2014 cohort onward. The key to a meaningful cohort analysis is segmentation, which can give you a highly specific, more actionable insights to base your decisions on. In SaaS, it can be useful to segment cohorts by pricing plan. 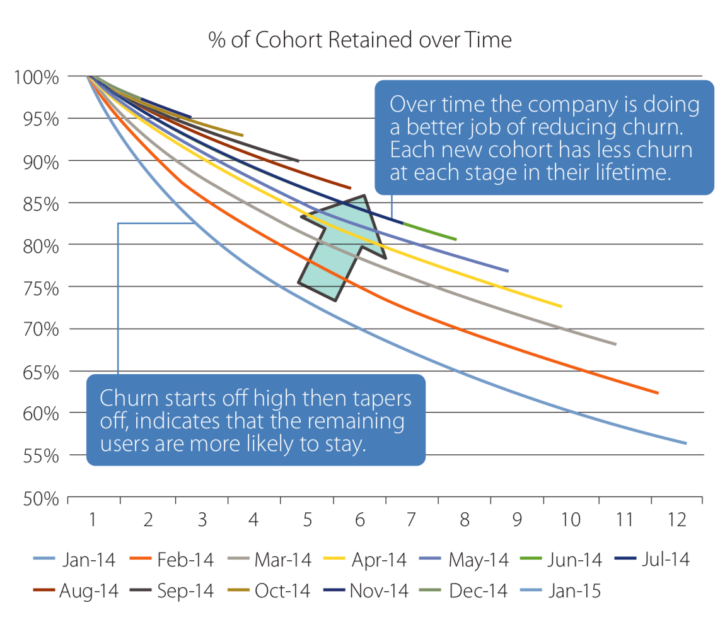 Typically, each plan will have its own characteristics in terms of churn and retention. Segmenting your cohorts will help uncover this, rather than simply looking at high-level metrics. You can also segment by geographical region, customer characteristics (size of company, etc.) and many more attributes! The Ultimate Cohort Analysis Cheat Sheet (ChartMogul) — Our comprehensive cheat sheet on performing and interpreting cohort analyses. Print a copy and keep it handy! Tips & Tricks: Creating a cohort analysis to understand user acquisition (ChartMogul) — This post walks you through a practical example of a specific cohort analysis use case in ChartMogul. Cohort Analysis (ChartMogul) — An in-depth guide on working with cohort analyses in ChartMogul. Cohort Analysis: A (practical) Q&A (The Angel VC) — SaaS VC Nicolas Wittenborn covers the finer points of building your own cohort analysis in this useful Q&A post. Make trial-to-paid conversion rates meaningful with Cohorts (ChartMogul) — A specific use case where cohorts can help you understand trial-to-paid conversion rates.